La Jolla means "the jewel," a fitting name for the beaches of La Jolla's coast. Here the coastline varies dramatically, from 300-foot sea cliffs, to rocky reefs, to secluded coves and wide golden sandy shores. La Jolla Shores is a mile-long crescent of prime sand beach favored by active beachgoers of all interests. At the northernmost point of La Jolla is Torrey Pines City Beach. Fortified by 300-foot sea cliffs, a nature walk along the bluffs through native vegetation-including the signature Torrey pine-leads to endless views of the Pacific. La Jolla Cove is a small deep water bay, flanked by sea caves accessible to adventurers in kayaks and on foot, depending on the tides. The Children's Pool, located close to downtown La Jolla and within walking distance from La Jolla Cove, is a small cove protected by a concrete breakwater wall. Although now closed for swimming, the Children's Pool offers a crowd-pleasing and often amusing view of these loveable marine inhabitants. This splendid black sand beach is a great place for whale watching. Located north of the small hamlet of Shelter Cove 45 miles south of Eureka in a remote region of the "Lost Coast," it's the trailhead for the famous King Range hike. This is a day-only beach, so campers will have to head for the mountains, but it is a a 3.5-mile stretch of coastline well worth exploring. O.B., as the locals call it, is a popular beach on the west coast of San Francisco, bordering the Pacific Ocean. It is adjacent to Golden Gate Park, the Richmond District, and the Sunset District. 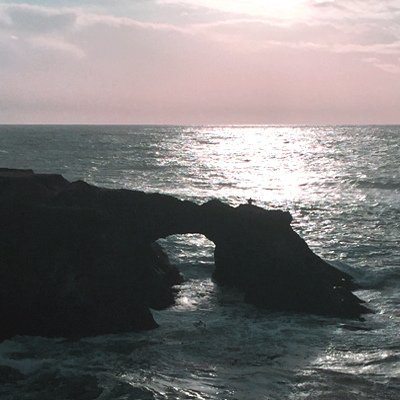 The Great Highway runs alongside the beach, and the Cliff House and the site of the former Sutro Baths sit at the northern end. The beach is a part of the Golden Gate National Recreation Area, which is administered by the National Park Service. It is popular with surfers, though the water is frigid with rapid rip currents which make it dangerous for casual swimmers. Nevertheless, the beach is one of the Bay Area's top beach spots. Malibu Lagoon State Beach, a beautiful spot with 22 acres of wetlands, gardens and sandy beach, is located on the point formed where Malibu Creek ends at the ocean. Here the creek pools up to form Malibu Lagoon and in the winter the beach berm breaches to allow tidal flows which separate the lagoon beach from the rest of Surfrider Beach. It's considered one of the world's premiere surfing beaches. Venice Beach has been labeled as a cultural hub known for its eccentricities. Street performers, artists and "the beautiful people" mingle and stroll all the way to Santa Monica along the famous boardwalk that runs through this famous California beach town. It includes the promenade that runs parallel to the beach, several handball courts, paddle tennis courts, Skate Dancing plaza, numerous beach volleyball courts, the bike trail and the businesses on Ocean Front Walk. No trip to Los Angeles would be complete without a trip to this iconic beach. This shady, sandy, Santa Barbara beach features rocky tide pools and stands of sycamore and oaks along El Capitan Creek. It's a perfect setting for swimming, fishing, surfing, picnicking and camping. A stairway provides access from the bluffs to the beach area, and a bike trail connects the park with Refugio State Beach. This long, sandy beach is located in the town of Aptos, Santa Cruz County. It features fire rings, a barbecue and picnic area, and is a popular summer spot. Rio Del Mar Beach starts in the waterfront area at the end of Rio Del Mar Boulevard and continues south for almost a mile on Beach Drive to the end. A sidewalk promenade has stairs to the beach in various spots. This beach is the southern part of Seacliff State Beach. The rest of the state park is on the other side of Aptos Creek. From the creek area it is easy to see the pier and a sunken concrete ship in the main part of Seacliff State Beach. 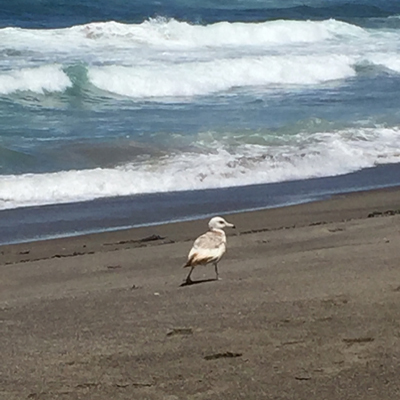 This quiet stretch of Northern California sand dunes and sea bird sanctuaries is a must-see. 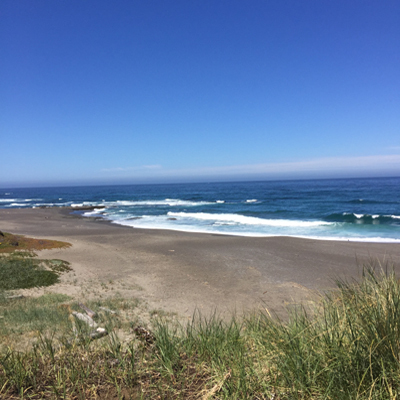 Located just north of Fort Bragg, Ten Mile Beach is the long stretch of coastline at Inglenook Fen Ten Mile Dunes Preserve in MacKerricher State Park. 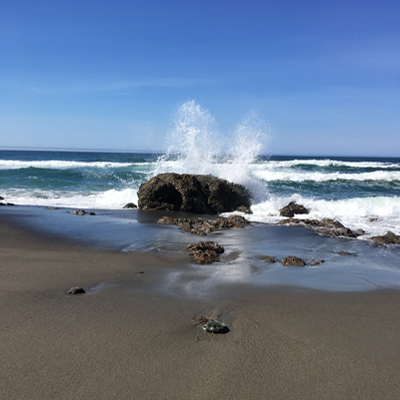 Here walkers and hikers can see close-up views of sea lions, snowy plovers, seasonal whales frolicking in the surf, and more. The clean beach stretches for about four miles and offers visitors a chance to clear their thoughts with the music of the pounding surf. The beach starts at the north end of Main Beach and continues all the way to Ten Mile Creek just south of Seaside Beach. This beach is less than a half hour drive from San Francisco. Heading north on Highway 101, from the Golden Gate Bridge, the small southern Marin "town" of Muir Beach is just 6 miles from the Highway 1 exit. It's one of the most glorious regions of Northern California in the Golden Gate National Recreation Area. Fishing, surfing and campfires are allowed, and there are many coastal trails above the beach for hikers to explore. This beautiful area is full of wildlife: Monarch butterflies in the pine trees, salmon in Redwood Creek, frogs in the pasture, fox, birds, deer, coyotes and more. Drakes Beach is a remote beach in Point Reyes National Seashore that requires a long scenic drive to reach. Starting at the parking lot is a path that climbs up to the Peter Behr Overlook with views down on Drakes Beach and the bay. Drakes Beach is protected by the point at Chimney Rock, so the surf is typically mellow enough for stand-up paddleboarding and playing at the water's edge. The beach is wide and sandy near the parking lot and extends in both directions for beach walking. Chimney Rock has trails and a spectacular seal viewpoint just a short drive away.